Spring has finally sprung here in Michigan. The other day it was over 80 degrees for the first time in six months. We are finally (I hope, anyway!) beyond the threat of snow, and now it’s the time of year where yard clean up and lawn care become a focus. We see the remnants of winter’s neglect…gray, flaccid leaves on the ground; pale grass trying to wake up while other portions are already shaggy… it’s uneven and messy and in various states of life right now. 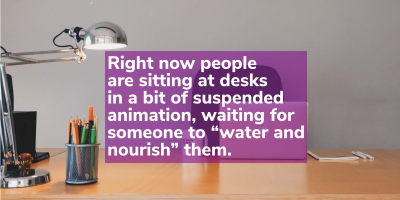 If your workplace is like most others, right now people are sitting at desks in a bit of suspended animation, waiting for someone to “water and nourish” them. They may even be looking online for other companies to provide their developmental opportunities. Given that money trees don’t exist and so resources for development are not unending, how do you choose to whom you should give the development opportunities? One characteristic to consider is who is in a critical role. What roles in your company must stay occupied by an engaged and brilliant person? What role that, if empty or worse—filled with a lackluster performer, could shrink sales, cause clients to leave, result in risk to the corporation? Odds are as you’ve read those words, roles and people in them have come to your mind. Keep those roles and people on your priority list for training, development, and re-recruiting (checking in with them to make sure they’re engaged, interested, not looking elsewhere). Another consideration is completely role agnostic and is all about the individuals themselves. Who stands out as having a learning orientation? That is, who is humble enough to know they need to be constantly learning and taking initiative in finding learning opportunities? Those are the people who will respond best to development. 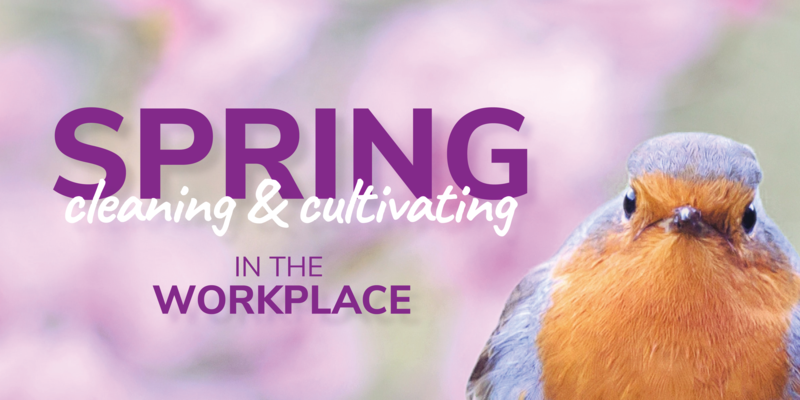 For these flowers in your workplace garden, stretch assignments, mentoring programs, and outside coaching can be the equivalent of Miracle-Gro. Apply the same treatment to people who are resistant to feedback, afraid of change, arrogant, or not interesting in learning and you can end up wasting precious resources…the equivalent of pouring Miracle-Gro onto concrete. It just isn’t going to soak in or doing anything productive. But what about the cleaning part in this spring cultivating and cleaning analogy? First, much of spring cleaning is about de-cluttering. Many companies, and thus the roles in them, have a hodge podge of urgent tasks and goals and long-term strategies, and well-intended people can be confused about what their workplace priorities even are. Good and talented people can spend days and weeks working on the wrong tasks. While many companies have a strategic plan somewhere that some small group created, very few companies keep their strategic priorities front and center and aligned to daily activity. Re-focusing on the strategic priorities and the effective communication of them to every employee and tying those priorities directly to the jobs those employees are doing… this is the necessary de-cluttering that the foolish executive will say they don’t have time to do but the wise one will dig in and do the hard work upfront to ensure greater success down the road. And the more obvious extension of cleaning—the pruning of dead branches? Yes, that’s a part of strong leadership too. Just remember that sometimes difficult conversations about performance are necessary, and really you aren’t doing anyone a favor by putting them off. That employee who isn’t cutting it? He knows it, deep down. And he deserves to be told. Development programs, strategic priorities focus, and having difficult conversations. That’s our recipe for a season of healthy growth for the people who make up your organization.